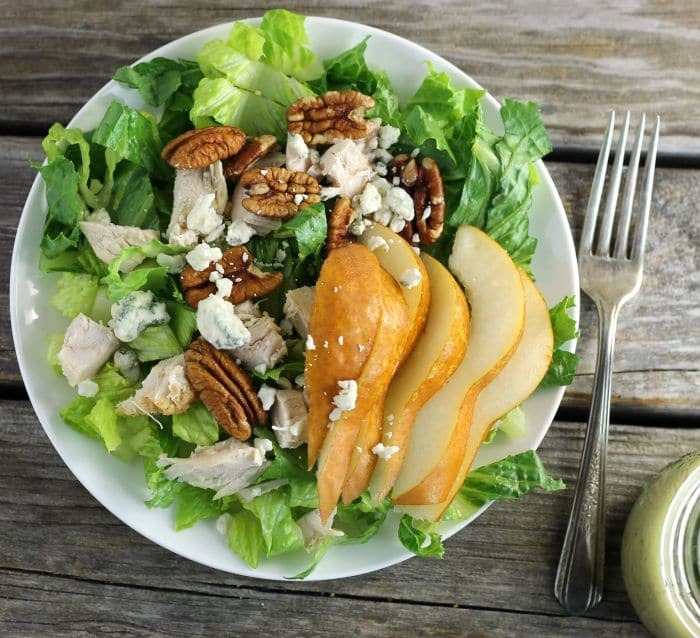 Chicken, Pear, and Blue Cheese Salad with Sweet Onion Dressing is a great salad for your lunch or dinner. 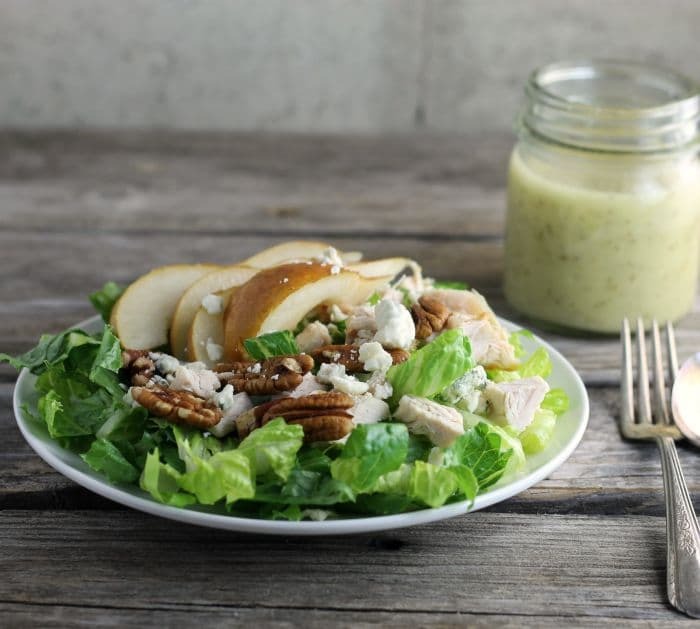 Chicken, pear, and blue cheese salad with sweet onion dressing is such a great combination of flavors. It hasn’t been very long that I started pairing fruit with green lettuce salads. It is kind of funny that how things have changed since I started blogging. The whole blogging thing has opened my eyes to new flavors and ways of eating food. To tell the truth I can’t believe that some of the recipes that I make these days are due to the fact that I blog and that I read blogs from all over the world. This is one of the many things that I appreciate about blogging. So as for this salad, I stopped at the grocery store after work one night, Mike was traveling for work and I wanted to pick up something for dinner. I saw one of those pre-made salads in the deli area that had apples, pecans, lettuce, blue cheese, and sweet onion dressing. Instead of buying the salad I decided to make my own version, but instead of the apple, I used a Bosc pear. I love the sweet pear with the combination of the salty blue cheese. The sweet onion dressing ties the whole salad together. Delicious! 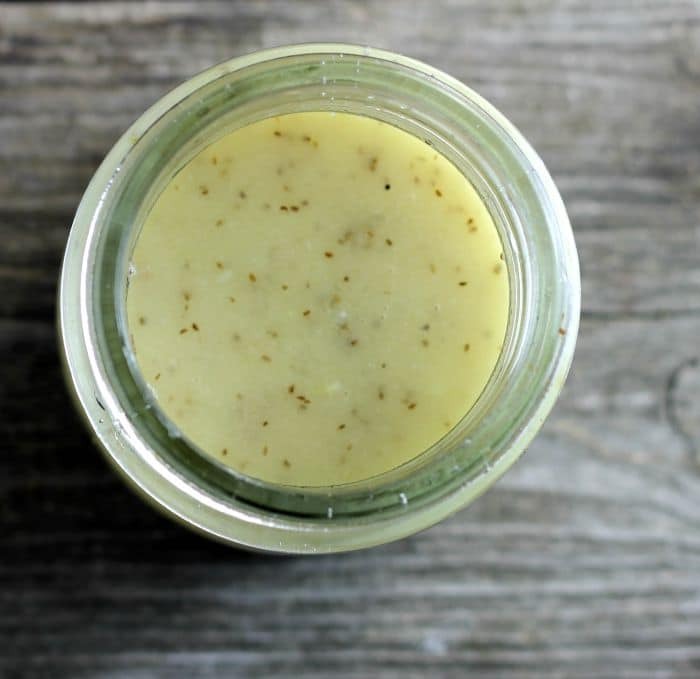 To make the vinaigrette: Add the onion to a food processor ( I use a mini food processor) with the Dijon mustard, and sugar. Blend until the onion is finely chopped. Add the vinegar and blend. Slowly add the olive oil until blended. Add the celery seed and blend in. Add salt to taste if desired. To assemble the salad: Wash and dry the lettuce. Tear into bite-size pieces. 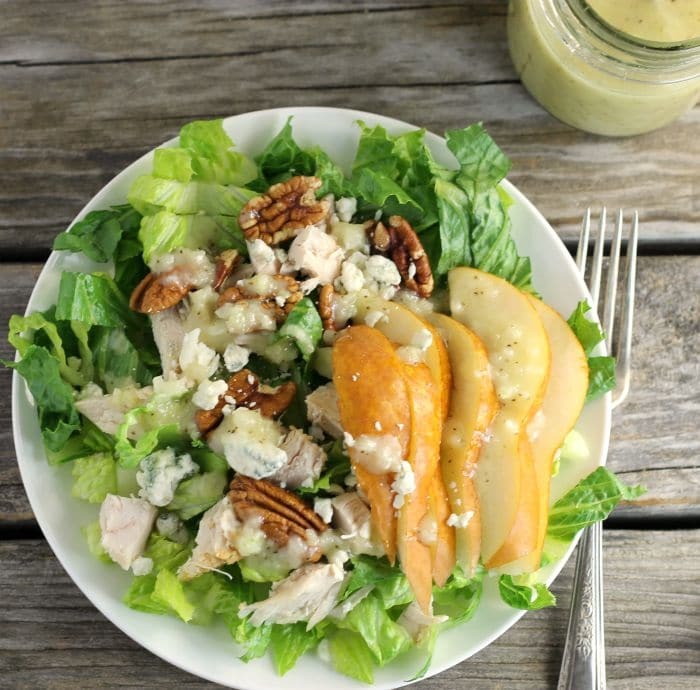 Place lettuce on plates top with the chicken, slices of pear, blue cheese, and pecans. Drizzle the salad dressing over the top of the salad. Serve. A lovely Fall salad! Pear, blue cheese and chicken…I just love everything! Such a nice combo of flavors and textures! This looks terrific — my kind of recipe. Thanks! Oh I loooove blue cheese and fruit together! One of my favorite salads has strawberries and blue cheese and it’s just heavenly. I’ll have to try it with pear, and some of this dressing. Yum!